Chocolate can be so finicky in the summer with the heat but lucky for us these are best out of the refrigerator for a cool and minty treat that's great on a hot day. It is supposed to be 104F here today and 105F degrees tomorrow so anything cool is better, yes? I will be staying inside but I will probably be trying to come up with cold desserts to avoid using the oven. These are perfect for kids or adults because they are made in mini muffin pans and are two or three bite size. You could also get crazy and add a different extract to the fun such as almond or even root beer. Maybe that is a little crazy. :). Happy not baking! 1. Line one 12 cup mini muffin pan with cup liners. 2. 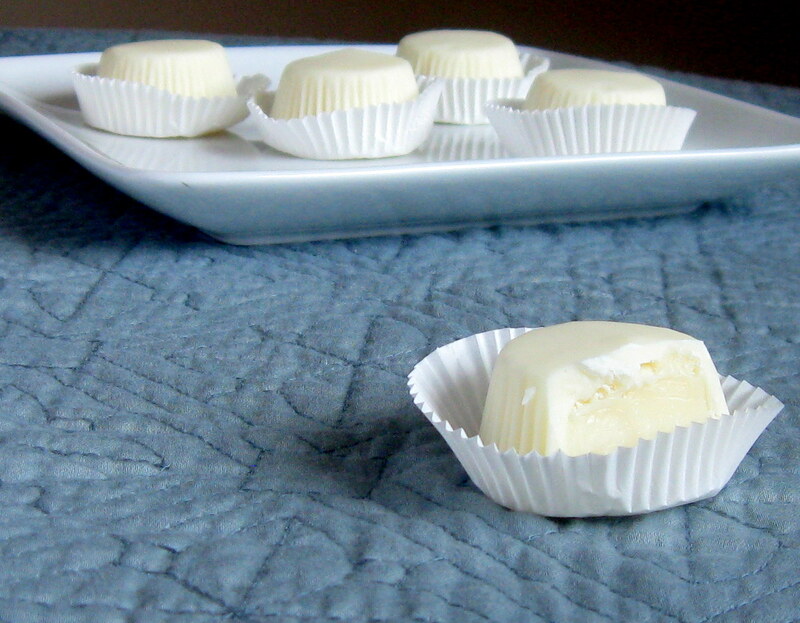 Place the 3 ounces of white chocolate in a bowl. Over medium heat, heat the heavy cream until just simmering around the edges but do not boil. Pour the heavy cream over the white chocolate. Let it sit for about 30 seconds then stir until the chocolate is melted. Add the butter and the extract to the white chocolate mixture and stir until blended. Cool for at least 20 minutes in the refrigerator. 3. Meanwhile, melt 6-8 ounces of chocolate for shells in a double boiler over low heat. Stir until melted completely. Using the back of the spoon spread about 1 teaspoon of white chocolate onto the bottom and sides of each cup so that they are evenly coated and there are no holes. Place the pan in the refrigerator for at least 5-10 minutes. 4. 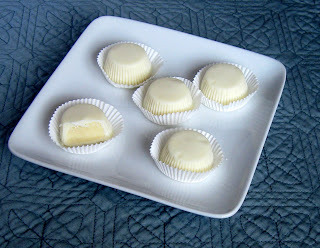 Remove the cups from the refrigerator (they should be hard) and evenly divide the white chocolate filling between them. 5. 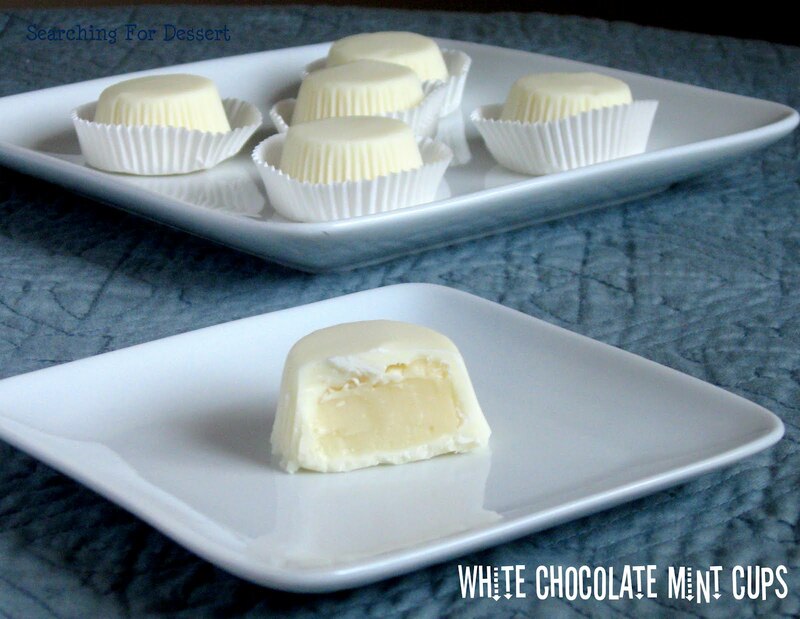 Re-warm the white chocolate on the double boiler if necessary and spoon or pipe white chocolate over the filling to seal it in completely, repeat for each cup. Place the pan back in the refrigerator to harden the chocolate, 10-15 minutes minimum. Serve cold or at room temperature. Yum! Those are so pretty! And I love mint.